My 7-year-old twin sons were gawking at the black plastic guns in the shooting range at the Mill Valley Carnival. It’s a game as old as American carnivals themselves. A row of toy guns shoot water into the lipsticked mouths of clowns. The carny was barking, “One shot for $3! 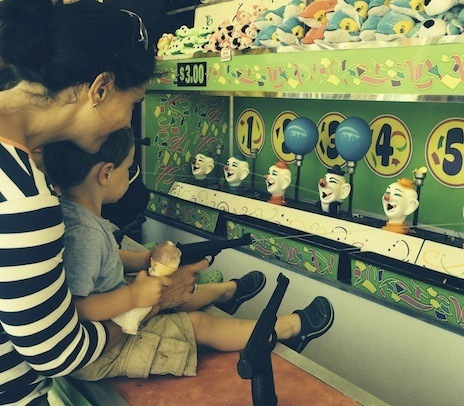 Two for five!” I watched my little boys take in the big boys, the guns, the wall of toys, and I felt my maternal power dwindle in the face of such a compelling lure. My sons know how I feel about gunplay, yet the more I forbid it, the more their curiosity draws them toward these forbidden objects—the toy version of the lethal instruments at the center of our national debate. A friend leaned over and whispered, “Did you hear about Santa Barbara?” He said it softly enough to shelter my sons from the news of another semiautomatic assault weapons massacre. The facts were similar to other such sprees: A disturbed and bullied young man purchased three semiautomatic assault weapons (legally) and 400 rounds of ammunition, and killed six college students and severely injured 13 others in the normally quiet beach town of Isla Vista, Calif. The 22-year-old shooter then took his own life. This time those killed were young people on the threshold of their future: a painter who liked to ballroom dance; a computer-science major who loved to work with children; a financial wizard who excelled at sports; a shy computer science major who was always helping others; an English major with an airline ticket to London; a computer engineer who never bragged about acing his SATs. And Thursday, in the course of writing this article, yet another shooting occurred, this time at Seattle Pacific University and leaving one dead and three college students injured. As of late January this year, there had been an average of one school shooting every other day in the U.S., despite pleas from parents for stronger gun control laws. In 2013, there were 28 school shootings. At least 17 Americans have died daily from gunshots since Newtown—although numbers may be higher due to unreported suicides. Since Jan. 1, there have been 4,594 deaths and 8,091 injuries caused by gun violence, 512 of them involving children (numbers as of Friday). To put it in an international context, children in the U.S. between the ages of 5 and 14 are at least 13 times more likely to be killed by guns than in any other industrialized nation. Too many towns to name, too many tragedies forgotten already by everyone except those whose sons, daughters, granddaughters, grandsons, sisters and brothers were taken. My boys’ intrigue with guns was immediate and early—leaving me grappling with the question: Does banning gunplay foster peace-loving kids or does it force our sons (although some girls engage in war play, I’m talking about boys predominantly, because research has shown that boys are more often drawn to war play than girls) to find less healthy releases for their aggressive impulses?My belief that only boys raised in pro-military or violent homes would gravitate toward gunplay was overturned by my sons’ fascination with guns and all things war related. Even though I chose to ban TV and video games from my home (in favor of books, audiobooks and old-fashioned outdoor play), to my surprise, guns and superhero stories found their way into my sons’ consciousness. They learned about rifles from the hunters who shoot Babar’s mother and the rifle-carrying safari hunters who capture Horton in Dr. Seuss’ classic “Horton Hatches the Egg.” Even Christopher Robin owns a popgun. In preschool, my sons learned about superheroes—and how to beat my system. “I’m Spider-Man!” shouted Quinn, pointing two fingers at me menacingly. “I’m shooting you with my web!” Banned from gunplay in his San Francisco preschool, my son and his peers found a way around it.